Yep, I know it’s a debate. Truthfully I don’t think there is a right or wrong answer. I’m talking about the topic of decorating for Christmas before Thanksgiving Day. Let me start by saying, it’s all about the traditions and what makes your heart happy. For this reason, my halls are already decked for the season on Thanksgiving. In my mind, Nov 1 bErin’s the whole season of Jolliness. Part of this is because it’s how I was raised, so it’s tradition. Growing up, our home would already be decorated for Christmas on Thanksgiving Day. It felt so festive! This week I’ve been asked several times if it was okay to start decorating for Christmas even if you host Thanksgiving. I say TOTALLY! We’re hosting Thanksgiving and the house is already very festive for Christmas! 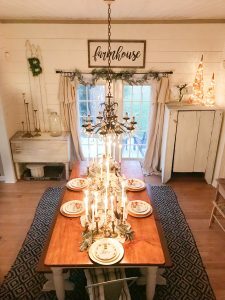 I’m styling my table with classics such as gold metals, candle sticks, and ironstone to blend Thanksgiving with Christmas decor. Just wanted to write this blog to say if it makes your heart happy to begin enjoying the Christmas decor, go ahead. On the other hand, if it makes you’re heart happy to wait, that’s okay too! As for me, I’ll be enjoying my Thanksgiving dessert beside the Christmas tree. PS – These pics are from Thanksgiving last year!